Thankyou to all EPTC Members that have renewed membership for 2017/18. As part of the facility advancements at EPTC, we have activated the online court booking system that enables access to our facilities by the whole community. The cost of court usage for EPTC Members is zero and the information below outlines the procedures to complete your registration (if required) and for use of the courts. The Book-a-Court system at Eildon Park Tennis Club has been activated and is now to be used for the booking of all courts. The general PIN code that has been used to open the gate will soon be invalid. your EPTC Membership renewal may not be fully completed in which case you should take action as outlined further below. If you are invited to complete your Book-a-Court registration simply click the link at the bottom of the invitation email to begin the process of completing your registration. Enter your preferred password combination and complete any personal details that are not already pre-populated. This step is necessary as the Book-a-Court system database is standalone from other systems used by EPTC, Tennis Victoria and Tennis Australia. Once completed, you are registered and then may make court bookings. 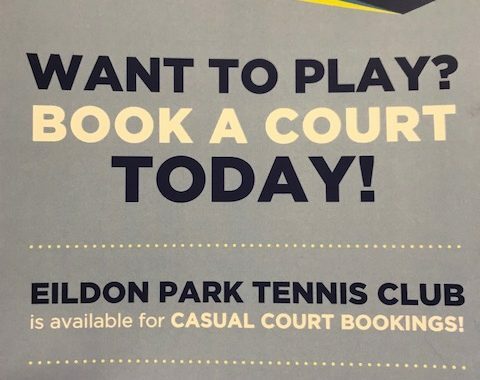 Click on the “Book A Court” tab and you will be taken to the Book-a-Court system home page for Eildon Park Tennis Club. To see court availability click on the link “>View Booking sheet” which appears at the bottom of the box labelled “When do you want to play?”. Within the booking sheet you can view existing bookings and can select the day, time and court that you wish to book. When you create a booking the system will request your login information. Follow the instructions including adding players to your booking. At the conclusion of your booking, the system will generate an acknowledgement message, email and (if selected) an SMS. The acknowledgement message will contain your 4 digit PIN for court access. Cost for court usage by EPTC Members is zero. However should any non-member guests be added to the booking there is a fee payable during the booking process. This fee is calculated when you use the “+add player” function to your booking. Guests are provided a 5 digit PIN code which is usable for that booking. You can elect to send SMS notifications of the court booking to your EPTC players and guests. You can access the courts 10 minutes prior to the start of your booking time. All players should use the access gate at the southern end of the carpark (i.e. the gate next to the preschool centre), entering their PIN access code on the keypad on the right hand side of the gate as they enter the facility. This should be done for all bookings even if the gate is open due to competition, coaching or club event. If the gate is closed when you enter, please close it after you pass through. Play on the court that you have booked and for the times booked. This requirement applies equally to Members, competition, coaching, club events and casual users. For those that do not receive the Book-a-Court system invitation email by 26 December, please text your name to 0438 759 245 (Michael Tomlinson) who will confirm the status of your EPTC Membership and Book-a-Court registration. It is likely that your membership details have been renewed later than the time of our upload into the Book-a-Court database and due to the time of year there may be a slight delay to further align the required information. Should you have questions regarding operation of the Book-a-Court system, please do not hesitate to contact me. The system provides a number of significant advantages including full visibility of court availability and a mechanism for all tennis players (EPTC Members and fee paying casual users) to access the courts. The EPTC Committee trusts that this initiative enhances your use and enjoyment of the EPTC playing facilities.